Not to be confused with European bison. The aurochs (/ˈɔːrɒks/ or /ˈaʊrɒks/; pl. aurochs, or rarely aurochsen, aurochses), also known as urus or ure (Bos primigenius), is an extinct species of large wild cattle that inhabited Europe, Asia, and North Africa. It is the ancestor of domestic cattle; it has also been suggested as an ancestor genetically to the modern European bison, which have been crossbred with steppe bison. The species survived in Europe until 1627, when the last recorded aurochs died in the Jaktorów Forest, Poland. During the Neolithic Revolution, which occurred during the early Holocene, at least two aurochs domestication events occurred: one related to the Indian subspecies, leading to zebu cattle, and the other one related to the Eurasian subspecies, leading to taurine cattle. Other species of wild bovines were also domesticated, namely the wild water buffalo, gaur, wild yak and banteng. In modern cattle, numerous breeds share characteristics of the aurochs, such as a dark colour in the bulls with a light eel stripe along the back (the cows being lighter), or a typical aurochs-like horn shape. The aurochs was variously classified as Bos primigenius, Bos taurus, or, in old sources, Bos urus. However, in 2003, the International Commission on Zoological Nomenclature "conserved the usage of 17 specific names based on wild species, which are predated by or contemporary with those based on domestic forms", confirming Bos primigenius for the aurochs. Taxonomists who consider domesticated cattle a subspecies of the wild aurochs should use B. primigenius taurus; those who consider domesticated cattle to be a separate species may use the name B. taurus, which the Commission has kept available for that purpose. The words aurochs, urus, and wisent have all been used synonymously in English. But the extinct aurochs/urus is a completely separate species from the still-extant wisent, also known as European bison. The two were often confused, and some 16th-century illustrations of aurochs and wisents have hybrid features. The word urus (/ˈjʊərəs/; plural uri) is a Latin word, but was borrowed into Latin from Germanic (cf. Old English/Old High German ūr, Old Norse úr). In German, OHG ūr was compounded with ohso "ox", giving ūrohso, which became early modern Aurochs. The modern form is Auerochse. The word aurochs was borrowed from early modern German, replacing archaic urochs, also from an earlier form of German. The word is invariable in number in English, though sometimes a back-formed singular auroch and/or innovated plural aurochses occur. The use in English of the plural form aurochsen is nonstandard, but mentioned in The Cambridge Encyclopedia of the English Language. It is directly parallel to the German plural Ochsen (singular Ochse) and recreates by analogy the same distinction as English ox (singular) and oxen (plural). During the Pliocene, the colder climate caused an extension of open grassland, which led to the evolution of large grazers, such as wild bovines. Bos acutifrons is an extinct species of cattle that has been suggested as an ancestor for the aurochs. The oldest aurochs remains have been dated to about 2 million years ago, in India. The Indian subspecies was the first to appear. During the Pleistocene, the species migrated west into the Middle East (western Asia), as well as to the east. They reached Europe about 270,000 years ago. The South Asian domestic cattle, or zebu, descended from Indian aurochs at the edge of the Thar Desert; the zebu is resistant to drought. Domestic yak, gayal, and Bali cattle do not descend from aurochs. Three wild subspecies of aurochs are recognised. Only the Eurasian subspecies survived until recent times. The Eurasian aurochs (B. p. primigenius) once ranged across the steppes and taigas of Europe, Siberia and Central Asia, and East Asia. It is noted as part of the Pleistocene megafauna, and declined in numbers along with other megafauna species by the end of Pleistocene. The Eurasian aurochs were domesticated into modern taurine cattle breeds around the sixth millennium BC in the Middle East, and possibly also at about the same time in the Far East. Aurochs were still widespread in Europe during the time of the Roman Empire, when they were widely popular as a battle beast in Roman arenas. Excessive hunting began and continued until the species was nearly extinct. By the 13th century, aurochs existed only in small numbers in Eastern Europe, and the hunting of aurochs became a privilege of nobles, and later royal households. The aurochs were not saved from extinction, and the last recorded live aurochs, a female, died in 1627 in the Jaktorów Forest, Poland, from natural causes. Aurochs were found to have lived on the island of Sicily, having migrated via a land bridge from Italy. After the disappearance of the land bridge, Sicilian aurochs evolved to be 20% smaller than their mainland relatives due to insular dwarfism. Fossilized specimens were found in Japan, possibly herded with steppe bison. The Indian aurochs (B. p. namadicus) once inhabited India. It was the first subspecies of the aurochs to appear, at 2 million years ago, and from about 9000 years ago, it was domesticated as the zebu. Fossil remains indicate wild Indian aurochs besides domesticated zebu cattle were in Gujarat and the Ganges area until about 4–5000 years ago. Remains from wild aurochs 4400 years old are clearly identified from Karnataka in South India. The North African aurochs (B. p. africanus) once lived in the woodland and shrubland of North Africa. It descended from aurochs populations migrating from the Middle East. The North African aurochs was morphologically very similar to the Eurasian subspecies, so this taxon may exist only in a biogeographic sense. However, evidence indicates it was genetically distinct from the Eurasian subspecies. Depictions show that North African aurochs may have had a light saddle marking on its back. This subspecies may have been extinct before the Middle Ages. The appearance of the aurochs has been reconstructed from skeletal material, historical descriptions, and contemporaneous depictions, such as cave paintings, engravings, or Sigismund von Herberstein’s illustration. The work by Charles Hamilton Smith is a copy of a painting owned by a merchant in Augsburg, which may date to the 16th century. Scholars have proposed that Smith's illustration was based on a cattle/aurochs hybrid, or an aurochs-like breed. The aurochs was depicted in prehistoric cave paintings and described in Julius Caesar's The Gallic War, Book 6, Ch. 28. The aurochs were one of the largest herbivores in postglacial Europe, comparable to the wisent (European bison). The size of an aurochs appears to have varied by region; in Europe, northern populations were bigger on average than those from the south. For example, during the Holocene, aurochs from Denmark and Germany had an average height at the shoulders of 155–180 cm (61–71 in) in bulls and 135–155 cm (53–61 in) in cows, while aurochs populations in Hungary had bulls reaching 155–160 cm (61–63 in). The body mass of aurochs appears to have shown some variability. Some individuals were comparable in weight to the wisent and the banteng, reaching around 700 kg (1,540 lb), whereas those from the late-middle Pleistocene are estimated to have weighed up to 1,500 kg (3,310 lb), as much as the largest gaur (the largest extant bovid). 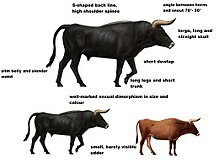 The sexual dimorphism between bulls and cows was strongly expressed, with the cows being significantly shorter than bulls on average. Because of the massive horns, the frontal bones of aurochs were elongated and broad. The horns of the aurochs were characteristic in size, curvature, and orientation. They were curved in three directions: upwards and outwards at the base, then swinging forwards and inwards, then inwards and upwards. Aurochs horns could reach 80 cm (31 in) in length and between 10 and 20 cm (3.9 and 7.9 in) in diameter. The horns of bulls were larger, with the curvature more strongly expressed than in cows. The horns grew from the skull at a 60° angle to the muzzle, facing forwards. The proportions and body shape of the aurochs were strikingly different from many modern cattle breeds. For example, the legs were considerably longer and more slender, resulting in a shoulder height that nearly equalled the trunk length. The skull, carrying the large horns, was substantially larger and more elongated than in most cattle breeds. As in other wild bovines, the body shape of the aurochs was athletic, and especially in bulls, showed a strongly expressed neck and shoulder musculature. Therefore, the fore hand was larger than the rear, similar to the wisent, but unlike many domesticated cattle. Even in carrying cows, the udder was small and hardly visible from the side; this feature is equal to that of other wild bovines. The coat colour of the aurochs can be reconstructed by using historical and contemporary depictions. In his letter to Conrad Gesner (1602), Anton Schneeberger describes the aurochs, a description that agrees with cave paintings in Lascaux and Chauvet. Calves were born a chestnut colour. Young bulls changed their coat colour at a few months old to a very deep brown or black, with a white eel stripe running down the spine. Cows retained the reddish-brown colour. Both sexes had a light-coloured muzzle. Some North African engravings show aurochs with a light-coloured "saddle" on the back, but otherwise no evidence of variation in coat colour is seen throughout its range. A passage from Mucante (1596), describing the “wild ox” as gray, but is ambiguous and may refer to the wisent. Egyptian grave paintings show cattle with a reddish-brown coat colour in both sexes, with a light saddle, but the horn shape of these suggest that they may depict domesticated cattle. Remains of aurochs hair were not known until the early 1980s. Some primitive cattle breeds display similar coat colours to the aurochs, including the black colour in bulls with a light eel stripe, a pale mouth, and similar sexual dimorphism in colour. A feature often attributed to the aurochs is blond forehead hairs. Historical descriptions tell that the aurochs had long and curly forehead hair, but none mentions a certain colour for it. Cis van Vuure (2005) says that, although the colour is present in a variety of primitive cattle breeds, it is probably a discolouration that appeared after domestication. The gene responsible for this feature has not yet been identified. Zebu breeds show lightly coloured inner sides of the legs and belly, caused by the so-called zebu-tipping gene. It has not been tested if this gene is present in remains of the wild form of the zebu, the Indian aurochs. Like many bovids, aurochs formed herds for at least a part of the year. These probably did not number much more than 30. If aurochs had social behaviour similar to their descendants, social status was gained through displays and fights, in which cows engaged as well as bulls. Indeed, aurochs bulls were reported to often have had severe fights. As in other wild cattle, ungulates that form unisexual herds, considerable sexual dimorphism was expressed. Ungulates that form herds containing animals of both sexes, such as horses, have more weakly developed sexual dimorphism. During the mating season, which probably took place during the late summer or early autumn, the bulls had severe fights, and evidence from the forest of Jaktorów shows these could lead to death. In autumn, aurochs fed up for the winter and got fatter and shinier than during the rest of the year, according to Schneeberger. Calves were born in spring. According to Schneeberger, the calf stayed at the cow's side until it was strong enough to join and keep up with the herd on the feeding grounds. Calves were vulnerable to wolves and, to an extent, bears, while healthy adult aurochs probably did not have to fear these predators. In prehistoric Europe, North Africa, and Asia, big cats, such as lions and tigers, and hyenas were additional predators that probably preyed on aurochs. Historical descriptions, like Caesar's Commentarii de Bello Gallico or Schneeberger, tell that aurochs were swift and fast, and could be very aggressive. According to Schneeberger, aurochs were not concerned when a man approached, but when teased or hunted, an aurochs could get very aggressive and dangerous, and throw the teasing person into the air, as he described in a 1602 letter to Gesner. No consensus exists concerning the habitat of the aurochs. While some authors think that the habitat selection of the aurochs was comparable to the African forest buffalo, others describe the species as inhabiting open grassland and helping maintain open areas by grazing, together with other large herbivores. With its hypsodont jaw, the aurochs was probably a grazer and had a food selection very similar to domesticated cattle. It was not a browser like many deer species, nor a semi-intermediary feeder like the wisent. Comparisons of the isotope levels of Mesolithic aurochs and domestic cattle bones showed that aurochs probably inhabited wetter areas than domestic cattle. Schneeberger describes that during winter, the aurochs ate twigs and acorns in addition to grasses. After the beginning of the Common Era, the habitat of aurochs became more fragmented because of the steadily growing human population. During the last centuries of its existence, the aurochs was limited to remote regions, such as floodplain forests or marshes, with no competing domestic herbivores and less hunting pressure. The Vig-aurochs, one of two very well-preserved aurochs skeletons found in Denmark. The circles indicate where the animal was wounded by arrows. Genetic analyses show that the Texas Longhorn breed of cattle originated from an Iberian hybrid of domesticated wild aurochs from the Middle East and domesticated Indian aurochs. The aurochs, which ranged throughout much of Eurasia and Northern Africa during the late Pleistocene and early Holocene, is the wild ancestor of modern cattle. Archaeological evidence shows that domestication occurred independently in the Near East and the Indian subcontinent between 10,000 and 8,000 years ago, giving rise to the two major domestic taxa observed today: humpless Bos taurus (taurine) and humped Bos indicus (zebu), respectively. This is confirmed by genetic analyses of matrilineal mitochondrial DNA sequences, which reveal a marked differentiation between modern B. taurus and B. indicus haplotypes, demonstrating their derivation from two geographically and genetically divergent wild populations. A third domestication event possibly occurred from another form of the aurochs in Africa. The sanga cattle, a zebu-like cattle breed with no back hump, is commonly believed to originate from crosses between humped zebus with taurine cattle breeds. However, some archaeological evidence indicates these cattle were domesticated independently in Africa and that bloodlines of taurine and zebu cattle were introduced only within the last few hundreds years. Domestication of the aurochs began in the southern Caucasus and northern Mesopotamia from about the sixth millennium BC. Genetic evidence suggests that aurochs were independently domesticated in India and possibly also in northern Africa. Domesticated cattle and aurochs are so different in size that they have been regarded as separate species; however, large ancient cattle and aurochs have more similar morphological characteristics, with significant differences only in the horns and some parts of the cranium. A mitochondrial DNA study suggests that all domesticated taurine cattle originated from about 80 wild female aurochs in the Near East. Comparison of aurochs bones with those of modern cattle has provided many insights about the aurochs. Remains of the beast, from specimens believed to have weighed more than a ton, have been found in Mesolithic sites around Goldcliff, Wales. Though aurochs became extinct in Britain during the Bronze Age, analysis of bones from aurochs that lived about the same time as domesticated cattle traditionally suggested no genetic contribution to modern breeds. More recent work has pointed to substantial aurochs contributions to indigenous British cattle breeds, with the most material found in Kerry cattle. Indian zebu, although domesticated eight to ten thousand years ago, are related to aurochs that diverged from the Near Eastern ones some 200,000 years ago. African cattle are thought to have descended from aurochs more closely related to the Near Eastern ones. The Near East and African aurochs groups are thought to have split some 25,000 years ago, probably 15,000 years before domestication. The "Turano-Mongolian" type of cattle now found in northern China, Mongolia, Korea, and Japan may represent a fourth domestication event (and a third event among B. taurus–type aurochs). This group may have diverged from the Near East group some 35,000 years ago. Whether these separate genetic populations would have equated to separate subspecies is unclear. The maximum range of the aurochs was from Europe (excluding Ireland and northern Scandinavia), to northern Africa, the Middle East, India, and Central Asia. Until at least 3,000 years ago, the aurochs was also found in eastern China, where it is recorded at the Dingjiabao Reservoir in Yangyuan County. Most remains in China are known from the area east of 105°E, but the species has also been reported from the eastern margin of the Tibetan plateau, close to the Heihe River. In Japan, excavations in various locations, such as in Iwate and Tochigi prefectures, have found aurochs which may have herded with steppe bison. 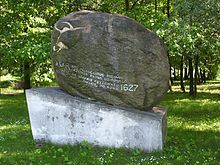 The inscription reads: "The Aurochs – Bos primigenius bojanus, the ancestor of domestic cattle, lived in this forest Jaktorów until the year 1627." By the time of Herodotus (fifth century BC), aurochs had disappeared from southern Greece, but remained common in the area north and east of the Echedorus River close to modern Thessaloniki. The last reports of the species in the southern tip of the Balkans date to the first century BC, when Varro reported that fierce wild oxen lived in Dardania (southern Serbia) and Thrace. By the 13th century AD, the aurochs' range was restricted to Poland, Lithuania, Moldavia, Transylvania, and East Prussia. The right to hunt large animals on any land was restricted first to nobles, and then gradually, to only the royal households. [clarification needed] As the population of aurochs declined, hunting ceased, and the royal court used gamekeepers to provide open fields for grazing for the aurochs. The gamekeepers were exempted from local taxes in exchange for their service. Poaching aurochs was punishable by death. According to a Polish royal survey in 1564, the gamekeepers knew of 38 animals. The last recorded live aurochs, a female, died in 1627 in the Jaktorów Forest, Poland, from natural causes. The causes of extinction were unrestricted hunting, a narrowing of habitat due to the development of farming, and diseases transmitted by domesticated cattle. While all the wild subspecies are extinct, B. primigenius lives on in domesticated cattle, and attempts are being made to breed similar types suitable for filling the extinct subspecies' role in the wild. The idea of breeding back the aurochs was first proposed in the 19th century by Feliks Paweł Jarocki. In the 1920s, a first attempt was undertaken by the Heck brothers in Germany with the aim of breeding an effigy (a look-alike) of the aurochs. Starting in the 1990s, grazing and rewilding projects brought new impetus to the idea and new breeding-back efforts came underway, this time with the aim of recreating an animal not only with the looks, but also with the behaviour and the ecological impact of the aurochs, to be able to fill the ecological role of the aurochs. In the early 1920s, two German zoo directors (in Berlin and Munich), the brothers Heinz and Lutz Heck, began a selective breeding program to breed back the aurochs into existence from the descendant domesticated cattle. Their plan was based on the concept that a species is not extinct as long as all its genes are still present in a living population. The result is the breed called Heck cattle. It resembles what is known about the appearance of the aurochs in colour, and in some cases, also horn shape. The Arbeitsgemeinschaft Biologischer Umweltschutz, a conservation group in Germany, started to crossbreed Heck cattle with southern-European primitive breeds in 1996, with the goal of increasing the aurochs-likeness of certain Heck cattle herds. These crossbreeds are called Taurus cattle. It is intended to bring in aurochs-like features that are supposedly missing in Heck cattle using Sayaguesa Cattle and Chianina, and to a lesser extent Spanish Fighting Cattle (Lidia). The same breeding program is being carried out in Latvia, in Lille Vildmose National Park in Denmark, and in the Hungarian Hortobágy National Park. The program in Hungary also includes Hungarian Grey cattle and Watusi. The Dutch-based Tauros Programme, (initially TaurOs Project) is trying to DNA-sequence breeds of primitive cattle to find gene sequences that match those found in "ancient DNA" from aurochs samples. The modern cattle would be selectively bred to try to produce the aurochs-type genes in a single animal. Starting around 2007, Tauros Programme selected a number of primitive breeds mainly from Iberia and Italy, such as Sayaguesa cattle, Maremmana primitivo, Pajuna cattle, Limia cattle, Maronesa cattle, Tudanca cattle, and others, which already bear considerable resemblance to the aurochs in certain features. Tauros Programme started collaborations with Rewilding Europe and European Wildlife, two European organizations for ecological restoration and rewilding, and now has breeding herds not only in the Netherlands but also in Portugal, Croatia, Romania, and the Czech Republic. Numerous crossbred calves of the first, second, and third offspring generations have already been born. An ecologist working on the Tauros programme has estimated it will take 7 generations for the project to achieve its aims, possibly by 2025. A further back-breeding effort, the Uruz project, was started in 2013 by the True Nature Foundation, an organization for ecological restoration and rewilding. It differs from the other projects in that it is planning to make use of genome editing. Its preliminary plans called for the use of Sayaguesa, Maremmana primitive, or Hungarian Grey (Steppe) cattle, and Texas Longhorn with wildtype colour or Barrosã cattle. The finalised plans now call for setting up two breeding lines, Sayaguesa × Maremmana primitiva/Hungarian Steppe cattle and Watusi × Chianina, and later crossing these lines. Two Watusi × Chianina breeding herds have been set up in Boxmeer and Breda in the Netherlands, another herd using Barrosã is being set up in northern Portugal. The newest of the back-breeding efforts, the Auerrindprojekt, was started in 2015 as a conjoint effort of the Experimentalarchäologisches Freilichtlabor Lauresham (Lauresham Experimental-Archaeological Open-air Laboratory, run by Lorsch Abbey), the Förderkreis Große Pflanzenfresser im Kreis Bergstraße e.V. (Promoting Association Megaherbivores in Bergstraße District) and the Landschaftspflegebetrieb Hohmeyer (Landscape Preservation Company Hohmeyer). In accordance with the breeding aims, the Auerrindprojekt has already set up two breeding herds of Watusi × Chianina and one breeding herd of Sayaguesa x Podolian cattle; a second breeding herd of Sayaguesa × Podolian cattle will be started in 2017. Scientists of the Polish Foundation for Recreating the Aurochs (PFOT) in Poland hope to use DNA from bones in museums to recreate the aurochs. They plan to return this animal to the forests of Poland. The project has gained the support of the Polish Ministry of the Environment. They plan research on ancient preserved DNA. Other research projects[which?] have extracted "ancient" DNA over the past 20 years and their results have been published in such periodicals as Nature and PNAS. [full citation needed] Polish scientists Ryszard Słomski and Jacek A. Modliński believe that modern genetics and biotechnology make it possible to recreate an animal almost identical to the aurochs. They say this research will lead to examining the causes of the extinction of the aurochs, and help prevent a similar occurrence with domesticated cattle. Highland cattle – their genome has been secondarily introgressed by European aurochs. Approaches that aim to breed an aurochs-like phenotype do not equate to an aurochs-like genotype. In 2015, researchers mapped the draft genome of a British aurochs dated to 6,750 years before present. Researchers compared the genome to the genomes of 73 modern cattle populations and found that traditional or landrace cattle breeds of Scottish, Irish, Welsh, and English origin – such as Highland, Dexter, Kerry, Welsh Black, and White Park – carry the ancestry of the sequenced aurochs, but the other populations did not. Another study concluded that because of this genomic introgression of the aurochs into these breeds, if this reflects "the bigger picture across the aurochs/cattle range, perhaps several subpopulations of aurochs are not extinct at all." The study proposed that it will be possible to consider breeding back cattle "that are genetically akin to specific original aurochs populations, through selective cross-breeding of local cattle breeds bearing local aurochs-genome ancestry." 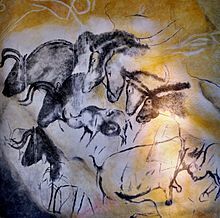 The aurochs was an important game animal appearing in both Paleolithic European and Mesopotamian cave paintings, such as those found at Lascaux and Livernon in France. Aurochs existed into the Iron Age in Anatolia and the Near East, where it was worshiped as a sacred animal, the Lunar Bull, associated with the Great Goddess and later with Mithras. In 2012, an archaeological mission of the British Museum, led by Lebanese archaeologist Claude Doumet Serhal, discovered at the site of the old American school in Sidon, Lebanon, the remains of wild animal bones, including those of an aurochs, dating from the late-fourth to early-third millennium. A 1999 archaeological dig in Peterborough, England, uncovered the skull of an aurochs. The front part of the skull had been removed, but the horns remained attached. The supposition is that the killing of the aurochs in this instance was a sacrificial act. ... those animals which are called uri. These are a little below the elephant in size, and of the appearance, colour, and shape of a bull. Their strength and speed are extraordinary; they spare neither man nor wild beast which they have espied. These the Germans take with much pains in pits and kill them. The young men harden themselves with this exercise, and practice themselves in this sort of hunting, and those who have slain the greatest number of them, having produced the horns in public, to serve as evidence, receive great praise. But not even when taken very young can they be rendered familiar to men and tamed. The size, shape, and appearance of their horns differ much from the horns of our oxen. These they anxiously seek after, and bind at the tips with silver, and use as cups at their most sumptuous entertainments. They survived in the wild in Europe till late in the Roman Empire and were occasionally captured and exhibited live in shows in the colosseum. The Hebrew Bible contains numerous references to the untameable strength of re'em, translated as "bullock" or "wild-ox" in Jewish translations and translated rather poorly in the King James Version as "unicorn", but recognised from the last century by Hebrew scholars as the aurochs. When the aurochs became rarer, hunting it became a privilege of the nobility and a sign of a high social status. The "Nibelungenlied" describes Siegfried killing aurochs: "Darnach schlug er schiere einen Wisent und einen Elch, starker Ure viere und einen grimmen Schelch", meaning "After that, he defeated one wisent and one elk, four aurochs, and one Schelch" - the background of the "Schelch" is dubious. Aurochs horns were commonly used as drinking horns by the nobility, which led to the fact that many aurochs horn sheaths are preserved today (albeit often discoloured). The drinking horn at Corpus Christi College, Cambridge, given to the college on its foundation in 1352, probably by the college's founders, the Guilds of Corpus Christi and the Blessed Virgin Mary, is thought to come from an aurochs. A painting by Willem Kalf depicts an aurochs horn. The horns of the last aurochs bulls, which died in 1620, were ornamented with gold and are located at the Livrustkammaren in Stockholm today. Schneeberger writes that aurochs were hunted with arrows, nets, and hunting dogs. With immobilised aurochs, a ritual was practised that might be regarded as cruel nowadays: the curly hair on the forehead was cut from the skull of the living animal. Belts were made out of this hair and were believed to increase the fertility of women. When the aurochs was slaughtered, a cross-like bone (os cardis) was extracted from the heart. This bone, which is also present in domesticated cattle, contributed to the mystique of the animal and magical powers have been attributed to it. A 16th-century illustration by Teodoro Ghisi, believed to show an aurochs, although the horns and muzzle differ from those of an aurochs. In eastern Europe, where it survived until nearly 400 years ago, the aurochs has left traces in fixed expressions. In Russia, a drunken person behaving badly was described as "behaving like an aurochs", whereas in Poland, big, strong people were characterized as being "a bloke like an aurochs". In Central Europe, the aurochs features in toponyms and heraldic coats of arms. For example, the names Ursenbach and Aurach am Hongar are derived from the aurochs. An aurochs head, the traditional arms of the German region Mecklenburg, figures in the coat of arms of Mecklenburg-Vorpommern. The aurochs (Romanian bour, from Latin būbalus) was also the symbol of Moldavia; nowadays, they can be found in the coat of arms of both Romania and Moldova. An aurochs head is featured on an 1858 series of Moldavian stamps, the so-called Bull's Heads (cap de bour in Romanian), renowned for their rarity and price among collectors. In Romania there are still villages named Boureni, after the Romanian word for the auroch. The horn of the aurochs is a charge of the coat of arms of Tauragė, Lithuania, (the name of Tauragė is a compound of taũras "auroch" and ragas "horn"). It is also present in the emblem of Kaunas, Lithuania, and was part of the emblem of Bukovina during its time as an Austro-Hungarian Kronland. The Swiss Canton of Uri is named after the aurochs; its yellow flag shows a black aurochs head. East Slavic surnames Turenin, Turishchev, Turov, and Turovsky originate from the Slavic name of the species tur. In Slovakia, toponyms such as Turany, Turíčky, Turie, Turie Pole, Turík, Turová (villages), Turiec (river and region), Turská dolina (valley) and others are used. Turopolje, a large lowland floodplain south of the Sava River in Croatia, got its name from the once-abundant aurochs (Croatian: tur). The ancient name of the Estonian town of Rakvere, Tarwanpe or Tarvanpea, probably derives from "Aurochs head" (Tarvan pea) in ancient Estonian. In 2002, a 3.5-m-high and 7.1-m-long statue of an aurochs was erected in Rakvere, Estonia, for the town's 700th birthday. The sculpture, by artist Tauno Kangro, has become a symbol of the town. Aurochs are frequently mentioned in the A Song of Ice and Fire series of fantasy novels by George R. R. Martin; in particular, roasted aurochs are sometimes served at banquets. In the 2012 movie Beasts of the Southern Wild, the six-year-old main character imagines aurochs, though the fantasy creatures are portrayed by "costumed" Vietnamese Pot-bellied piglets. Ashurnasirpal II's hunting of "wild oxen"
This article incorporates Creative Commons license CC BY-2.5 text from reference. ^ a b Tikhonov, A. (2008). "Bos primigenius". The IUCN Red List of Threatened Species. IUCN. 2008: e.T136721A4332142. doi:10.2305/IUCN.UK.2008.RLTS.T136721A4332142.en. Retrieved 11 January 2018. ^ "Aurochs – Bos primigenius". petermaas.nl. Archived from the original on 20 April 2009. ^ "ICZN, Biodiversity Studies BZN Volume 63, Part 3, General Articles & Nomenclatural Notes". 30 September 2006. ^ AHD4, s.vv. "aurochs", "urus", "wisent". ^ MWU, s.vv. "aurochs", "urus", "wisent". ^ Pyle, C. M. (1994). "Some late sixteenth-century depictions of the aurochs (BosprimigeniusBojanus, extinct 1627): New evidence from Vatican MS Urb. Lat. 276". Archives of Natural History. 21 (3): 275–288. doi:10.3366/anh.1994.21.3.275. ^ a b AHD4, headword "urus". ^ a b c d e f g h i j k l m n o p q r s t u v w x y z aa ab ac ad ae van Vuure, Cis (2005). Retracing the Aurochs – History, Morphology and Ecology of an extinct wild Ox. ISBN 954-642-235-5. ^ Crystal, David (2003). The Cambridge Encyclopedia of the English Language (2nd ed.). Cambridge University Press. ISBN 0-521-53033-4. ^ a b c Edwards, C.J. ; Magee, D.A. ; Park, S.D.E. ; McGettigan, P.A. ; Lohan, A.J. ; et al. (2010). "A Complete Mitochondrial Genome Sequence from a Mesolithic Wild Aurochs (Bos primigenius)"". PLoS ONE. 5 (2): e9255. doi:10.1371/journal.pone.0009255. PMC 2822870. PMID 20174668. ^ Park, Stephen D. E.; Magee, David A.; McGettigan, Paul A.; Teasdale, Matthew D.; Edwards, Ceiridwen J.; Lohan, Amanda J.; Murphy, Alison; Braud, Martin; Donoghue, Mark T. (26 October 2015). "Genome sequencing of the extinct Eurasian wild aurochs, Bos primigenius, illuminates the phylogeography and evolution of cattle". Genome Biology. 16: 234. doi:10.1186/s13059-015-0790-2. PMC 4620651. PMID 26498365. ^ Braud, Martin; Magee, David A.; Park, Stephen D. E.; Sonstegard, Tad S.; Waters, Sinead M.; MacHugh, David E.; Spillane, Charles (2017). "Genome-Wide microRNA Binding Site Variation between Extinct Wild Aurochs and Modern Cattle Identifies Candidate microRNA-Regulated Domestication Genes". Frontiers in Genetics. 8: 3. doi:10.3389/fgene.2017.00003. PMC 5281612. PMID 28197171. ^ a b Kurosawa Y. "モノが語る牛と人間の文化 -　② 岩手の牛たち" (pdf). LIAJ News No.109. Oshu city Cattle Museum: 29–31. Retrieved 6 April 2016. ^ a b HASEGAWA Y.，OKUMURA Y., TATSUKAWA H. (2009). "First record of Late Pleistocene Bison from the fissure deposits of the Kuzuu Limestone, Yamasuge，Sano-shi，Tochigi Prefecture，Japan" (pdf). Bull.Gunma Mus.Natu.Hist.(13). Gunma Museum of Natural History and Kuzuu Fossil Museum: 47–52. Retrieved 6 April 2016. ^ In the Light of Evolution III: Two Centuries of Darwin. National Academies Press. 2009. p. 96. ^ a b Beja-Pereira, Albano (2006). "The origin of European cattle: Evidence from modern and ancient DNA". Proc. Natl. Acad. Sci. U.S.A. 103: 8113–8118. doi:10.1073/pnas.0509210103. PMC 1472438. PMID 16690747. ^ a b c d e Frisch, Walter (2010). Der Auerochs: Das europäische Rind. ISBN 978-3-00-026764-2. ^ Pyle, C. M. (1995). "Update to: "Some late sixteenth-century depictions of the aurochs (Bos primigenius Bojanus, extinct 1627): New evidence from Vatican MS Urb. Lat. 276"". Archives of Natural History. 22 (3): 437–438. doi:10.3366/anh.1995.22.3.437. ^ "The Internet Classics Archive – The Gallic Wars by Julius Caesar". classics.mit.edu. ^ Kysely, René (2008). Aurochs and potential crossbreeding with domestic cattle in Central Europe in the Eneolithic period. A metric analysis of bones from the archaeological site of Kutná Hora-Denemark (Czech Republic). Anthropozoologica. ^ Ryder, M. L. (1984). "The first hair remains from an aurochs (Bos primigenius) and some medieval domestic cattle hair". Journal of Archaeological Science. 11: 99–101. doi:10.1016/0305-4403(84)90045-1. ^ Beutler, Axel (1996). Die Großtierfauna Europas und ihr Einfluss auf Vegetation und Landschaft. ^ Magret Bunzel-Drüke; Joachim Drüke & Henning Vierhaus (2001). Der Einfluss von Großherbivoren auf die Naturlandschaft Mitteleuropas. ^ Anthony H. Lynch Julie Hamilton & Robert E. M. Hedges (2008). Where the Wild Things Are: Aurochs and Cattle in England. ^ Grigson, Caroline (1991). "An African origin for African cattle? — some archaeological evidence". African Archaeological Review. 9 (1): 119–144. doi:10.1007/BF01117218. ^ Bradley, DG; MacHugh, DE; Cunningham, P; Loftus, RT (1996). "Mitochondrial diversity and the origins of African and European cattle". Proceedings of the National Academy of Sciences of the United States of America. 93 (10): 5131–5. doi:10.1073/pnas.93.10.5131. PMC 39419. ^ Molecular Biology and Evolution, 14 March 2012. ^ "Modern Taurine Cattle Descended from Small Number of Near-Eastern Founders" (PDF). Retrieved 23 April 2014. ^ "Rescuing a Mesolithic foreshore". Time Team. Season 11. Episode 8. 22 February 2004. ^ Park, Stephen D E; Magee, David A.; McGettigan, Paul A.; Teasdale, Matthew D.; Edwards, Ceiridwen J.; Lohan, Amanda J.; Murphy, Alison; Braud, Martin; Donoghue, Mark T.; Liu, Yuan; Chamberlain, Andrew T.; Rue-Albrecht, Kévin; Schroeder, Steven; Spillane, Charles; Tai, Shuaishuai; Bradley, Daniel G.; Sonstegard, Tad S.; Loftus, Brendan J.; MacHugh, David E. (26 October 2015). "Genome sequencing of the extinct Eurasian wild aurochs, Bos primigenius, illuminates the phylogeography and evolution of cattle". Genome Biology. 16 (1). doi:10.1186/s13059-015-0790-2. PMC 4620651. PMID 26498365. ^ "History, Morphology And Ecology Of The Aurochs" (PDF). Retrieved 9 August 2011. ^ McKenzie, Steven (17 February 2010). "Ancient giant cattle genome first". BBC News. ^ Zong, G (1984). A record of Bos primigenius from the Quaternary of the Aba Tibetan Autonomous Region, Volume XXII No. 3. Vertebrata PalAsiatica. pp. 239–245. ^ a b "Ηρόδοτος" 5th century BC: Πολύμνια. ^ Kitchell, K.F. 2013: Animals in the Ancient Word from A to Z. ^ Rokosz', Mieczyslaw (1995). "History of the Aurochs (Bos Taurus Primigenius) in Poland" (PDF). Animal Genetics Resources Information. Food and Agriculture Organization. 16: 5–12. doi:10.1017/s1014233900004582. Archived from the original (PDF) on 14 January 2013. ^ Heck, H. (1951). "The Breeding-Back of the Aurochs". Oryx. 1 (3): 117. doi:10.1017/S0030605300035286. ^ Margret Bunzel-Drüke. "Projekt Taurus – En økologisk erstatning for uroksen. Translated into Danish by Karsten Thomsen. Lohne: ABU 2004; Århus: Nepenthes, 2005" (PDF). Archived from the original (PDF) on 4 March 2016. ^ Uffe Gjøl Sørensen. "Vildokserne ved Lille Vildmose 2003–2010. Status rapport med anbefalinger til projektets forvaltning København: UG Sørensen Consult, 2010" (PDF). Archived from the original (PDF) on 14 November 2013. ^ "Stichting Taurus Vee". 2010. ^ Stephan Faris (12 February 2010). "Breeding Ancient Cattle Back from Extinction". TIME. ^ Rewilding Europe: “Tauros Programme.” Retrieved 6 March 2016. ^ Rewilding Europe: “Rewilding Partners.” Retrieved 6 March 2016. ^ European Wildlife: “How we work.” Retrieved 6 March 2016. ^ European Wildlife (13 April 2011): “The Aurochs is coming back to European forests and grasslands.” Retrieved 6 March 2016. ^ "Stichting Taurus, Official website". ^ "True Nature Foundation Starts International Project To Bring Back The Aurochs". Kjprnews.com. 26 October 2013. Retrieved 6 March 2014. ^ "Uruz Project". True Nature Foundation. 2014. Archived from the original on 7 March 2014. Retrieved 6 March 2014. ^ Gineke Mons (3 October 2013). "Gentechnologie voor fokken oeros". melkvee.nl. Retrieved 6 March 2014. ^ True Nature Foundation: “Aurochs: Species Restoration.” Archived 16 January 2015 at the Wayback Machine Retrieved 6 March 2016. ^ True Nature Foundation (23 December 2014): “Uruz Project Expands In The Netherlands.” Facebook. Retrieved 6 March 2016. ^ True Nature Foundation (4 July 2014): “Amersfoort Zoo (Dierenpark Amersfoort) has donated their Watusi ...” and “Watusi – Founder herd in Breda (Netherlands) is thriving.” Facebook. Retrieved 6 March 2014. ^ True Nature Foundation (15 December 2013): ″The True Nature Foundation has come to an agreement with the municipality of Salto in northern Portugal ...″ Facebook. Retrieved 6 March 2014. ^ Auerrindprojekt. Official website. Retrieved 6 March 2014. ^ Lorsch Abbey website: “The Aurcattle project.” Retrieved 5 June 2017. ^ Auerrindprojekt: “Partner.” Retrieved 6 March 2014. ^ Kloster Lorsch (Lorsch Abbey): Freilichtlabor Lauresham: Allgemeine Informationen. Archived 6 March 2016 at the Wayback Machine Official website. Retrieved 6 March 2014. ^ Förderkreis Große Pflanzenfresser im Kreis Bergstraße e.V. Official website. Retrieved 6 March 2014. ^ Landschaftspflegebetrieb Hohmeyer Official website. Retrieved 6 March 2014. ^ Auerrindprojekt: “Zuchtplan.” Retrieved 6 March 2014. ^ Roberta (14 February 2016), “Lauresham Aurcattle are taking off.” Carnivora Forum, Aurochs – Bos primigenius, p. 121. Overview and sources. Retrieved 6 March 2014. ^ "Polish geneticists want to recreate the extinct auroch Science and Scholarship in Poland". Polish Press Agency (PAP). 28 November 2007. ^ Park, Stephen D E; Magee, David A.; McGettigan, Paul A.; Teasdale, Matthew D.; Edwards, Ceiridwen J.; Lohan, Amanda J.; Murphy, Alison; Braud, Martin; Donoghue, Mark T.; Liu, Yuan; Chamberlain, Andrew T.; Rue-Albrecht, Kévin; Schroeder, Steven; Spillane, Charles; Tai, Shuaishuai; Bradley, Daniel G.; Sonstegard, Tad S.; Loftus, Brendan J.; Machugh, David E. (2015). "Genome sequencing of the extinct Eurasian wild aurochs, Bos primigenius, illuminates the phylogeography and evolution of cattle". Genome Biology. 16. doi:10.1186/s13059-015-0790-2. PMC 4620651. PMID 26498365. ^ a b Sinding, Mikkel-Holger S.; Gilbert, M. Thomas P. (2016). "The Draft Genome of Extinct European Aurochs and its Implications for De-Extinction". Open Quaternary. 2. doi:10.5334/oq.25. ^ "Et si Europe était sidonienne ?". ^ Ajmone-Marsan, P.; Garcia, J.F. ; Lenstra, J.A. (2010). "On the Origin of Cattle: How Aurochs Became Cattle and Colonized the World". Evolutionary Anthropology. 19 (4): 148–157. doi:10.1002/evan.20267. ^ Davis, E.N. (1974). "The Vapheio Cups: One Minoan and One Mycenean?". The Art Bulletin. 56 (4): 472–487. doi:10.1080/00043079.1974.10789932. ^ De Grummond, W.W. (1980). "Hands and Tails on the Vapheio Cups". American Journal of Archaeology. 84 (3): 335–337. doi:10.2307/504710. ^ Douglas, N. 1927: Birds and Beasts of the Greek Anthology. Florence. ^ The National Cyclopaedia of Useful Knowledge, Vol III, (1847), London, Charles Knight, p.368. ^ The International Standard Bible Encyclopedia, Entry for 'Wild Ox'. Wm. B. Eerdmans Publishing Co. 1939. ^ "Corpus Drinking Horn". 3 December 2012. ^ van Vuure, Cis (2002). History, Morphology and Ecology of the Aurochs (Bos primigenius). ^ Fedosyuk, Yu. A. Russian Surnames. Popular Etymological Dictionary (6th ed.). ^ "Rakvere linn" (in Estonian). Archived from the original on 19 July 2011. C. Julius Caesar. Caesar's Gallic War. Book 6, Ch. 28 Translator. W. A. McDevitte. Translator. W. S. Bohn. 1st Edition. New York. Harper & Brothers. 1869. Harper's New Classical Library. Wikimedia Commons has media related to Aurochs. Wikisource has the text of the 1911 Encyclopædia Britannica article Aurochs. The Comeback of the European Icon. Rewilding Europe News, 8 November 2012. "Aurochs" . The American Cyclopædia. 1879.